At Canadian Tire Corp. there are 2,500 employees that are logging into Facebook on a regular basis to post, comment, like, and share while they’re on the clock – and their employer is encouraging them to do so. That’s because Canadian Tire is the first company in Canada to implement Facebook at Work, the new collaboration offering from the world’s largest social network that provides companies with a separate internal network. Just six weeks after being rolled out at the retailer, Facebook at Work is already providing a single place of collaboration for employees, says Bonnie Agostinho, vice-president of corporate at CTFS delivery, IT at Canadian Tire. Previously, the firm had multiple intranets for exchanging communication and relied on Microsoft Lync for some collaboration tasks. Unveiled in early January, Facebook at Work still isn’t generally available. But it’s been working with select customers on pilot projects. Though many employers discourage their employees from using the social network to look at their friend’s cat photos during work hours – or even block it with a firewall – the Silicon Valley-based firm is hoping its social networking solution can catch on for collaboration in the enterprise. Enterprise social media: the end of email? Interest in the product has been significant so far with 70,000 requests for access, according to Julien Codorniou, Facebook’s director of platform partnerships and Facebook at Work. Canadian Tire was among the first to reach out, with Duncan Fulton, president at FGL Sports Ltd. (a subsidiary of Canadian Tire) reaching out after working with Facebook on its social flyer offering and video ads. Eventually, all of Canadian Tire’s 85,000 employees across its multiple divisions and brands (including SportChek and Mark’s) will be able to access Facebook at work, Cordorniou says, from entry-level workers right up to the C-suite. So far Canadian Tire has on-boarded about 5,000 active users to Facebook at Work, Agostinho says. But the benefits of executive adoption is already being seen. When one call centre rep posted a question about why a certain function couldn’t be done online, a vice-president responded saying online support had just been added and it could, in fact, be accomplished online. “Before, the call centre rep probably would have struggled with that for weeks, gone to a manager, and that manager may not have known who to go to for the answer,” she says. Other examples of executive participation include the chief technology officer ranking as a top influencer, and the CEO posting pictures from the executive meeting. The chief operating officer from SportChek is also on every day, posting about his business. Canadian Tire held a big launch event for Facebook at Work to encourage its employees to adopt it. (It’s said that certain hockey player celebrities were in attendance.) It worked. As soon as the first email about the initiative was sent out, employees were claiming their own accounts whether they had received an invitation or not. One challenge the roll out is facing right now is that a Canadian Tire email address is required to register. Most store-based employees don’t have a corporate email address, so the team is looking into other ways to provide accounts. Just like its consumer counterpart, Facebook at Work is available as a mobile app via Google Play or the App Store. But Codorniou stresses again that there’s no connection to the social network for the masses. There are no ads, no games, and all of the data generated belongs to the company that operates it. 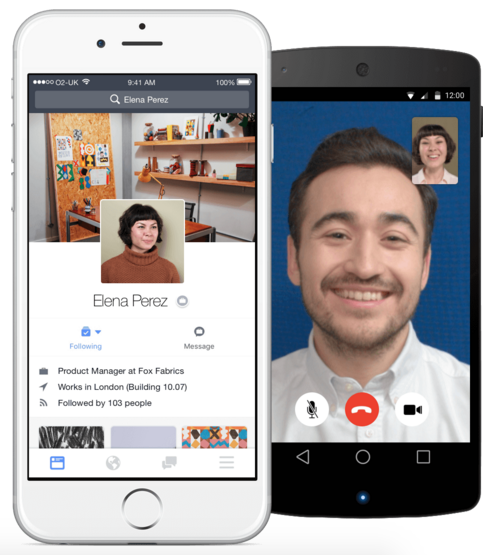 Facebook at Work offers mobile apps for Android and iOS, which include VoIP capabilities. “This is a place where work happens and you get the job done,” he says. Of course, Facebook is a cloud service and that means corporate data is stored on Facebook’s servers. Currently the data is replicated across four data centres – one in Sweden and three in the U.S., according to Codorniou. There’s no price tag on Facebook at Work yet. Beta testers like Canadian Tire are using it free of charge right now, and Cordorniou says a freemium business model will eventually be put in place. That would mean that Facebook at Work could be free to use for its social networking features, but a few dollars a month would give access to added support, analytics, and third-party integrations. How much would Agostinho pay for the solution, given her experience so far? “If it becomes the best, easiest way to collaborate across the organization, that’s worth a whole bunch of money,” she says. It can be hard to put a dollar value on productivity, she says. Also, she expects that the younger generation of workers just expect to have access to tools like the ones offered through Facebook. Then there are the unexpected uses. True to the platform, employees at Canadian Tire Financial Services started a group to share photos of their pets. Before long, the person responsible for buying pet supplies for Canadian Tire started using the group as a focus group, gathering reactions to new products that could potentially be added to store shelves. “If you’re going to be the most innovative retailer in the world, you want your employees all over this technology,” Agostinho says. Using Facebook at work may never be the same again.